Torridon gave me a cold. Woke up yesterday morning and someone had put cotton wool in ears and up my nose. With the sun coming up, Dan and I drove to Skye round the stunning coast road in the low bright. We got to Broadford and I mumbled round the co op in my weakend state buying (we later discovered) mostly bread related products and not much else. 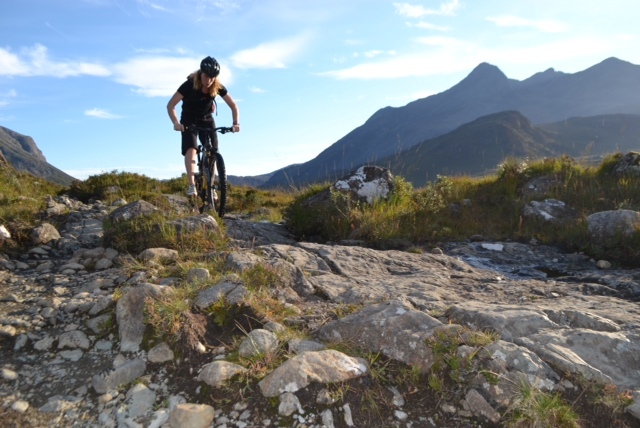 Then onto Luib and the start of the Sliachan ride. The day was dream like. Warm with blue sky. The perfect day for a mtb bike epic only I could t make my legs go round so bundled the Go Pro to Dan and retreated to the van to sleep the day away. At 4pm feeling a bit better, I rode up Glen Sliagchan to find him and we did the last bit of the route together in the now setting sun. He was, this day, my hero. But we couldn’t let that sort of thing continue so I beat him at pool in the pub.